Another Friday. Daydreaming of what to do with the weekend. As always, I hope the Saturday morning group ride happens. If not thats fine. I’ll fatbike by myself. I have new tires to try out anyway. New Vee Snowshoe. Like anything fatbike the only choice has been Surly for tires. Little by little others have trickled in. Most being just OK and nothing that would make me move away from my Nates and Knards. Until today. They call out a 4.7 and are noticeably bigger than the Nates but not that much bigger. But you can notice it anyway. I did notice that both tires came in lighter than the Nates. I also noticed they are cheaper than the Nates too. All the demos and tests came out favorable in all the forums. I’ll get to ride then Sunday, if not Saturday. Depending on weather. Looks like more snow Saturday. I just groomed at the park. Maybe again on Sunday? Ive groomed the ski trails more this year than the last three combined! And thats a good thing I guess. I’ll need to hold winter thoughts for a bit yet. Dare not turn the corner and look for spring just yet. I’ll have my personal thoughts on those tires on Monday. But I think they are keepers. file foto Sunny and warm! Let me do a complete 360 ( I really mean 180). I really am a winter guy. You pretty much have to be living in Wisconsin. But there comes a time in every winter where I turn the corner. When I have had enough and think warm thoughts. That time has not yet come but it is not far off. Maybe three weeks out. Those thoughts are triggered by many things. A good rain that washes away the ski trails (which Im grooming this afternoon). Also the arrival of my road bike. I have a Felt AR2 sitting on the floor waiting for some miles. I walk past it many times everyday and soon I will want to ride it. The more I see it, the more I want it to be 70 degrees. Its just screams summer. Another thing that triggers it is when the temps are so low that you just hunker down for days. Then, temps moderate and you get back outside and you get so pumped about being out that you wish you could just ride more. Any bike. Without dressing for 40 minutes. I have thought many times about taking a warm extended weekend trip to road ride in February. Its a good thought in theory but its when the store is slowest and the extra money just is not there. Bummer. I try not to make the mental switch too soon. Thats just brutal switching to summer mode too soon. You think its close enough to many get in a few miles on that new road bike and it snows the next day. This morning I did a few laps at the park on the ski’s. It was nice and all, but I would rather be riding. Did I ever get on the trainer? No, not yet. But I think Im kinda done with the skiing. I mean, I’ll go one or two more times but I wont ditch a bike ride to do it. I could have rode the fatbike just as easy today. So I will hold off on the California dreamin’ as long as I can. But no guarantee’s. Could this be the future of fatbiking? We all know the scenario. Being a skier also I hear the comments. Yesterday morning I read this post on Facebooks Fatbike group page. And kinda made me think a little. First off, the dude was ranting. He’s way off base but the theory is legit. Nobody wants someone else to damage “his\her” trail. Im not going to waste time rebutting his post. But the fact is these bikes are not for “winter exploration” anymore. As the bike numbers grow, and they will, many cross country ski systems will see the dollar signs and start grooming and staging events for these bikes. Of course its already started. I can only speak locally, but here the fatbike community of course stays off all ski trails. Knowing how cool it would be if we could ride them. But in time, many trail systems will at some point realize that when done properly a fatbike leaves little to no damage on the skate trails. Again, done properly. Conditions permitting of course. My first taste of ski trail wonder was the Fatbike Birkie last March up in Hayward, WI. Pretty much the center of cross country skiing in the Midwest. Up to that point any woods riding I did was either on a snowshoe trail or some hiking trail. Hitting those trails for that race was surreal. 20+ feet wide. Hard as cement and as fast as if it were summer on a MTB. Im not ashamed to say I ran 15 pounds of air. And still did not leave a footprint in the snow. What a experience. So where does that leave us. 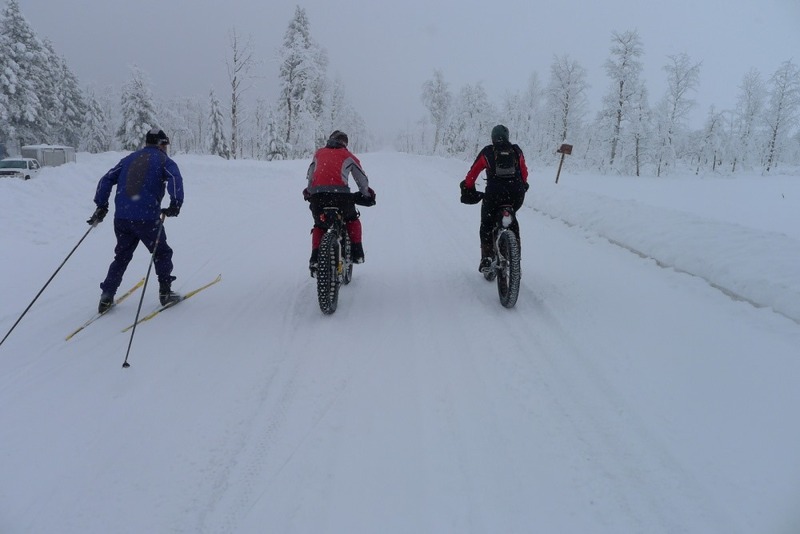 Skiers want to keep the fatbikes at bay and thats understandable. No skier wants to be skating down perfect corduroy only to have a bunch of crazy people on weird bikes ruin their experience. But being an individual who does both gives me an open mind. If the bikes are doing less to the trail than my skis then why not? I have had a dream (statement slightly changed not to slight MLK). In the future I will be riding my MTB on trails all summer. And my fatbike on groomed trails all winter. In the future you will be able to drive to a awesome trail system to hit up 20 miles of fast, perfectly groomed winter trails. And maybe another 20 miles somewhere else next week. Then hang in the warm house with a brew or two. How will this be possible? By somehow, someway combining ski and bikes on the same trail. Somehow. There. I said it out loud. I dont have the answer. Maybe classic to the left, bikes to the right, skaters down the middle? I dont know. Remember Im dreaming this right now. But I do know that these ski trail systems do not have the footprint on their land nor the added resources to extend miles and miles of bike only trail. I mean the resources to do it on an ongoing basis without volunteer help. But maybe the can “enhance” their existing ski trail to accommodate bikes without a lot of added work? Now I sure do know of several trail systems doing it now here in my area. Of course Marquette, MI is. The Levis Trow system in Neilsville, WI is also. And now there is some nice activity in Cable ,WI too. All separate trail. All single track specific to bikes. All volunteer maintained. And all a ton of fun. These single track trails are maybe three feet wide max. Ive been to many ski trail systems that are 20 yards wide. Could they, or would they spare three feet on the right? So what Im talking about is just one step further than the specific single track groom for bikes. Maybe it will never happen. Maybe its too much to ask or maybe some will try and it just wont work. But I can still dream. Because how fun would it be if it could be done. Ive somewhat come to a conclusion. Marquette gets too much snow? The bike trail system posted these two pics from yesterday. Showing the drifted over trails. Do they just get too much snow there to keep up? The weekend we were there it snowed quite a bit the nite before. Every trail system that is volunteer has only so much they can do. Is it too much to deal with up there? While I agree when the trails are spot on the riding up there is spectacular but how often is that? 50% of the time? That would be tough odds to plan a trip up there a month out. Absolutely not knocking those guys up there. For grooming bike trails they are cutting edge. I guess you have to be to try that much harder keeping up with all that snow. I wonder how much time those guys spend on those snowmobiles. Now, besides the groomer they have a “plow” apparatus that clears the snow off before they run the groomer thru. They need to remove the snow from the snow trails. I am tentatively planning another weekend up there Feb 22 and 23. Im wondering if I should rethink that. Find somewhere where with better odds at better conditions. Maybe late Feb would give us better odds at firm trail up there? I dont know. But I can kinda feel for them. I groom the local ski trails at our State Park and I know you have to make the time regardless. I can pretty much guess there is a guy up in Marquette getting burned out, not able to ride so much. When he’s not working or sleeping he’s grooming. Its not easy being the king of snowbike trails. We all have expectations. I have some more thoughts on those snowbike trails for another day. Maybe tomorrow.